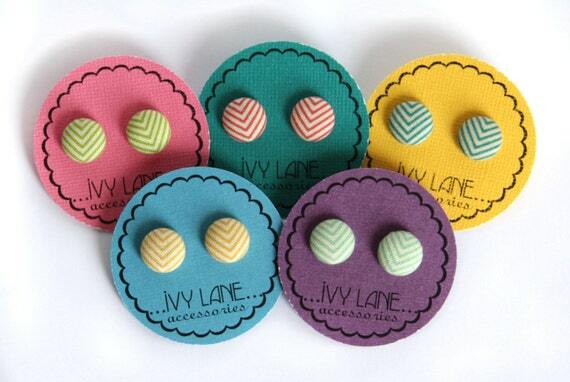 Today we have a giveaway from sweet Gina over at Ivy Lane Accessories. Gina makes the most ADORABLE fabric covered earrings. She’s offering 2 pairs of earrings to one lucky He & I reader. These earrings are the perfect accessory for your summer wardrobe. I currently have my eye on these darling skinny chevron earrings, the anchors, and these floral earrings.You can enter the giveaway below, ends Friday. Good luck! Congratulations to the winner Erica Lord! We will be emailing you shortly! p.s. the winner of the Little Mimmie giveaway will be announced over here today! Seriously, too many cute choices! The anchors might be my first pick though! those chevron earrings are so freakin cute! I like the I HEART you collection. Okay this is tough. It's either the Plum Polka Fabric covered earrings, the Purple Stripe fabric, or the Orange Polka fabric! They're all SO LOVELY!!! hard choice! Maybe the gray and white herringbone? How cute! Your daughter has cracked me up, she is so cute!!!! I LOVE the black and white polka dot and the skinny chevron earrings. But I also love E's adorable giggle! :] Baby giggles are my favorite! I love the Gray and White Herringbone Fabric Button Earrings - they'd go with everything! These earrings are adorable! I'm definitely a fan of the chevron. I love the I (heart) you collection! Super cute! She has the cutest laugh of all time! I love that laugh! She's so adorable! I love the plum and white polka dots ones, and the yellow and white stripe! So cute! That was so funny. She is the cutest!!! :)!